Strange College Dreams | Oh My Tiny Little Pea Head! So, I had a dream this weekend that I was back in college. Do you get those? This time it wasn’t the usual one where the semester is almost over, I haven’t been to class, and I can’t find my classroom. No, this one wasn’t panic-icky at all, but it was exhausting. It started with a combined “pre-party” in my room and the guys across the hall. Friends kept showing up, even a couple of those people you haven’t seen in years and suddenly they appear in your dream. So weird. Then in a blink of the eye we were up on the library quad at a party under a tent. People were drinking beer and walking around holding stacks of blue kegs cups. Bizarre! Next thing you know we’re back in the dorm playing quarters and laughing hysterically with the guys across the hall until 2:30 am. It was so strange. 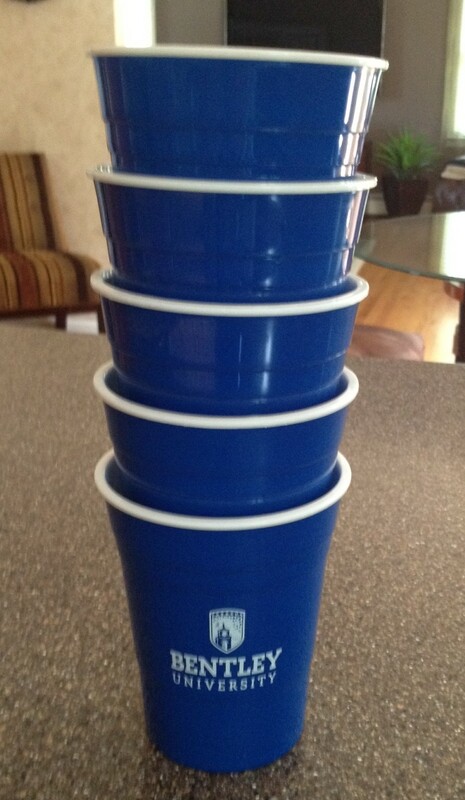 I woke up in the morning moving a little slower than usual, with a stack of the blue cups, and with a bad case of the “dropsies”. Ok, I confess – it felt like a strange college dream, but it actually happened! Yup, all of it. Saturday was my 25th college reunion and a bunch of us went back to college for the night. We went to a pretty small school and had a large, tight knit group of friends, so it was fun. A few of us stayed over night in the dorms just for kicks. It was hysterical. Since I have the time, I put a full course press on getting a good size group to go to the reunion. It’s hard with kid’s sports, graduation season, and summer getting started, but they rallied. It took several e-mails, texts, and Facebook messages back and forth (none of which existed in 1990 and we got together for parties every weekend! ), but it was worth it. It’s good to reconnect with old friends, share some memories, and just laugh. These are people you lived with for 4 years in extremely close quarters, we were growing up – together. We didn’t call and/or text our parents everyday – we talked to each other. When we didn’t know how to do something, we didn’t Google it, we figured it out – together. Every once in a while we need to remind ourselves life may get crazy, but we’re still in it – together. I know because in my tough times, they were there with me. I could literally give you a hundred examples, and I appreciate each and every one. But, Saturday night was just about having fun and remembering that crazy time in our young lives. Although I am now 46, I still feel like I am in my 20s and for one night we acted like it again. It was all like some strange college dream and when I woke up I felt every bit of 46! Good times, good friends, a dream come true – what more could you ask for!